Manicure with a gel-based nail lacquer which lasts up to two weeks with minimal wear. It is super durable and is removed with a low acetone polish remover. Relaxing foot soak + cut, file, and shape the nail + choose your aroma (Beautifying, Stress-Fix™, or Shampure™) + moisturizing mask + foot file + cuticle maintenance + foot and leg exfoliation massage + polish of your choice = beautiful feet. Foot soak + cut, file, and shape the nail + cuticle maintenance + polish of your choice = foot clean-up in a hurry. 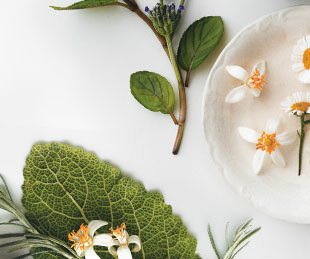 Sanctuary Pedicure + sensory journey with Aveda balancing key elements + specific exfoliate, thermal mask, and paraffin dip = the ultimate in luxurious foot care. Please inform your esthetician if you are using any doctor-prescribed skin care products or taking any medications (topically or otherwise). Waxing is not recommended for guests who have recently used Retin A, Adapalene, Renova®, Epiduo®, or any other medications for exfoliation as they thin the skin making it more vulnerable to lifting and sensitivity during waxing/sugaring.